When you take time to fully explore your retirement living options, you’ll be better prepared to make the choice that’s best for you. MEET AL SIEBERT, A DEVOTED MINISTER WHO FOLLOWS HIS CALLING TODAY FROM THE FOUNTAINS AT BOCA CIEGA BAY. If you’ve ever been to Northside Baptist Church, you probably already know Al Siebert. A popular minister there, he once had his own radio broadcast. Even in “retirement,” he continues to give sermons, sings in the choir and conducts community outreach for the church. It was through such outreach visits that he first became acquainted with The Fountains at Boca Ciega Bay, his home since January of 2013. Moving to new places never daunted Al. Over 40 years as a pastor took him to six different churches, from Winnipeg to Florida and to six interim pastorates. Semi-retired in the warm Florida sunshine, Al and his wife enjoyed a simple but happy life in their St. Petersburg mobile home. At 93, Al has counseled countless parishioners and has no plans to stop. 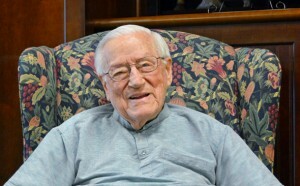 This quick witted, forward looking preacher plans to deliver a sermon on his 100th birthday. He has no intention of needing assisted living, though he’s grateful it’s available on site, so he won’t have to move to a new community if he ever needs the services. Having found such a well suited lifestyle, it disheartens Al when couples say, “We’re going to wait until something happens to one of us, then we’ll take care of it.” He learned the hard way that when couples situate themselves in a supportive setting “before they have to” they can put their worries about the future in the past.